Greenberg Traurig, LLP (GT) has more than 2,000 attorneys in 39 offices in the United States, Latin America, Europe, Asia, and the Middle East. GT has been recognized for its philanthropic giving, diversity, and innovation, and is consistently among the largest firms in the U.S. on the Law360 400 and among the Top 20 on the Am Law Global 100. Twitter: @GT_Law. Freeborn & Peters LLP is a full-service law firm, headquartered in Chicago, with international capabilities and offices in New York City; Richmond, Va.; Springfield, Ill.; and Tampa, Fla. Freeborn is always looking ahead and seeking to find better ways to serve its clients. It takes a proactive approach to ensure its clients are more informed, prepared and able to achieve greater success – not just now, but also in the future. While the firm serves clients across a very broad range of sectors, it has also pioneered an interdisciplinary approach that serves the specific needs of targeted industries. Freeborn is a firm that genuinely lives up to its core values of integrity, effectiveness, teamwork, caring and commitment, and embodies them through high standards of client service and responsive action. Its lawyers build close and lasting relationships with clients and are driven to help them achieve their legal and business objectives. Legility, a leader in Legal Operations, provides consulting, technology, managed solutions, and flexible legal talent engagement services to corporations and law firms. The company has more than 1,000 lawyers, engineers, consultants, technology and data specialists, and operational experts serving more than one-third of the Fortune 100 and one-quarter of the Am Law 200. Founded in 2000 as Counsel On Call, Legility works with corporate legal departments and law firms to improve operational efficiency. Polsinelli is an Am Law 100 firm with more than 850 attorneys in 22 offices. Ranked #30 for Client Service Excellence and #10 for best client relationships among 650 U.S. law firms, Polsinelli was also named among the top 30 best-known firms in the nation. The firm’s attorneys provide value through practical legal counsel infused with business insight, and focus on health care, financial services, real estate, intellectual property, mid-market corporate, labor and employment, and business litigation. Swanson, Martin & Bell, LLP, a nationally recognized litigation firm in Chicago, is dedicated to resolving contested matters for our clients. Jury trial experience is the hallmark of the firm. Our attorneys have tried hundreds of cases to verdict in a variety of complex civil and commercial disputes. Many large corporations, prestigious institutions, business owners and individuals retain Swanson, Martin & Bell, LLP in jurisdictions across the United States. Since its inception in 1992, the firm has grown to more than 130 attorneys in 24 practice areas with offices in Chicago, Lisle, Libertyville and Madison County, Illinois, St. Louis, Missouri, and Hammond, Indiana. The challenge may involve new medical technologies or advanced theories of engineering. A case may hinge on science and the ability to identify what is authentic, and what is not. Or it may involve complex business relationships, layers of insurance and reinsurance, or new rules governing workplace relations or professional responsibility. Whatever the case, our work for clients requires us to get at the truth of these complexities, and convey it in such a way that a judge or a jury has a simple choice to make. We appreciate that juries are careful investigators of the truth, and that judges take a dim view of advocates who gloss over complexities instead of doing the hard work of distilling them to their essence. There is a critical difference between "simple" and "simplistic." We make the complex simple in order to get at the truth of our clients' positions and convey that truth to those whose duty it is to try the facts. We do it every day on some of the most cutting-edge technical issues and convoluted concepts of causation and liability to be found. It's not the only way to practice law, but it's our way. Holland & Knight is a global law firm with more than 1,300 lawyers and other professionals in 28 offices. Our lawyers provide representation in litigation, business, real estate and governmental law. Interdisciplinary practice groups and industry-based teams provide clients with access to attorneys throughout the firm, regardless of location. Riley Safer Holmes & Cancila LLP is a national law firm whose lawyers have handled and successfully resolved some of the most challenging, complex, and high-stakes legal issues. They have a team of experienced lawyers, based in four offices, who serve their clients' interests nationally and around the world. Their clients range from individuals and small privately held companies to large international corporations. They represent dozens of publicly traded companies including many currently on the Fortune 100 list and several in the Fortune 50. Their lawyers are focused on obtaining the best results for their clients, from negotiated settlements to litigation and trial. They have tried hundreds of cases in more than 25 state and federal courts and have defended class actions in more than 30 different states. Their clients value and trust them because they offer much more than legal counsel. They understand and uphold their priorities, they serve as their partners and trusted advisors, and they align their services and their pricing with what matters most to them. They deliver value according to how their clients define value. They are a law firm built for clients. Diversity, equity and inclusion are at the heart of Husch Blackwell’s ability to serve our clients and community well. We promote a culture of inclusion and to build a workforce where individual differences are appreciated. Husch Blackwell is a an industry-focused litigation and business law firm with 700+ attorneys delivering innovative and strategic solutions to organizations around the world from offices in 18 U.S. cities. 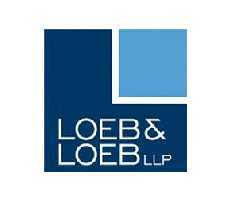 Loeb & Loeb prides itself on conducting and coordinating client matters expertly, efficiently and expeditiously. Our culture is geared toward establishing and strengthening long-term client relationships, with an emphasis on senior attorney involvement in all transactions and matters. Teams are kept to optimal size to provide the highest quality advice, utmost efficiency, and seamless, cost-effective service across practices and offices. Built on a 100+ year foundation of legal service, Ice Miller LLP is committed to helping our clients stay ahead of a changing world. Our diverse client base ranges from start-ups to Fortune 500 companies and from governmental entities to educational organizations and pension funds. Our clients span the business economy from service to industrial to tech. In the non-profit sector our experience includes work with charitable, fiduciary, educational and governmental entities. Our attorneys strive to develop a deep understanding of each client's needs in order to help them build, grow and protect their most valued assets. Ice Miller's clients are often economic and community drivers. Many are leaders in their fields and sectors. We work collaboratively with them to achieve their goals. To do that, we offer our greatest strength: our people. Ice Miller is a talent mosaic with the ability to bring the exact legal skills needed for specific projects from the routine to the complex. Every professional at Ice Miller is fully and deeply committed to providing our clients with innovative, responsive, relevant and cost-effective solutions. 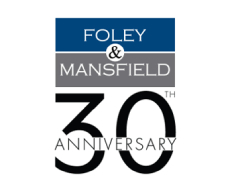 In a local community that is global in essence, Foley & Mansfield understands that having a diverse, multifaceted team allows us to provide the best legal solutions for our clients. Our objective is to increase diversity at Foley & Mansfield and make it a more inclusive organization. Diversity is represented by a number of characteristics, including gender, race, religion, creed, color, national origin, ancestry, marital status, disability, religious or political affiliation, age, sexual orientation, viewpoints, economic background, education and experience. Working together gives us all an enhanced appreciation for the subtle differences in cultural attitudes and style that make us each unique - and together, make our experience remarkable.